Some Australian furries are getting down and dirty in the national parks of Queensland, Australia, following the formation of a new furry community group, Furries Off Road. Although this four wheel driving group is still small when compared to the larger clubs, it hasn't stopped these fun-loving furs from making a big muddy splash on the many trails of central Queensland. 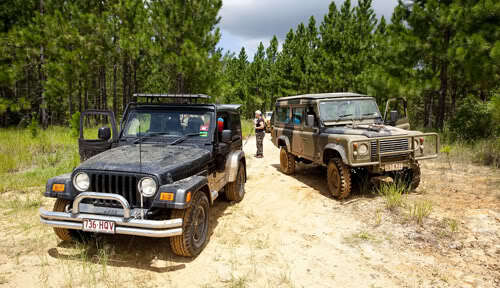 While officially the club consists only of seven members and four off road vehicles, the group reports it has successfully tackled it's way through the sandy trails of Bribie Island and the challenging mud-filled tracks of the Glass House Mountains, with plans to brave the D'Aguilar Range later this week. I think this group is great, I believe that we've got an original and fun idea that has the potential to expand nationally into a registered four wheel dive club as the fur community continues to grow and incorporate more four wheel drive owners that want to go out and have fun with like-minded people. The Furries Off Road group maintains a forum on the RecovFurry Network Website.